Even if the last boxing match you remember came in a year starting with "19," you probably know that Saturday night will feature one of the most anxiously-awaited and wildly-hyped fights in years. 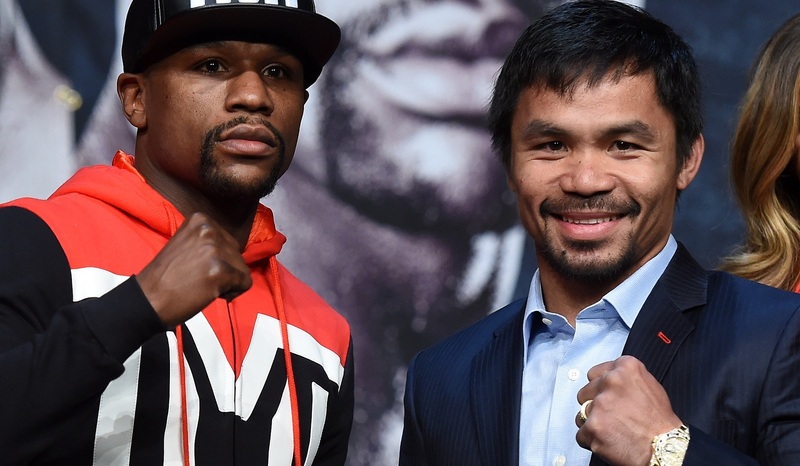 Floyd Mayweather and Manny Pacquiao will climb into the squared circle at the MGM Grand Garden Arena in Las Vegas to determine the best welterweight in the world and, by most accounts, the unofficial title of best fighter in this era. If you want to see the fight, which should start around 11 p.m., and watch it from the comfort of your home, you can order it as a pay-per-view event at a cost of just under $100 in high definition, or just under $90 in standard definition. But sporting spectacles like this are sometimes better enjoyed with a crowd. In Western New York, several establishments will carry the fight. It won't cost you as much as you would spend at home, but expect to pay a fee because the fight will cost the businesses that choose to show it thousands of dollars. Stir at Seneca Niagara Casino. $10 cover charge, starts at 9 p.m.
Acropolis OPA, 708 Elmwood Ave. $20 cover with two drink tickets at the door. Bada Bing, 42 W. Chippewa St. First come, first served, and admission to watch the fight is $20 per person. Bambino Bar & Kitchen, 297 Franklin St. $30 presale, $35 at the door. Includes four-course meal. Bar specials also available. Toni Pepperoni, 4224 Maple Road, Amherst, in the plaza that is home to the AMC Maple Ridge Theater. $25 covers the fight plus the usual assortment of food served at the restaurant, buffet style. Tickets available at the restaurant. Call Brian Marciniak at 603-8313 for information. Pharaoh's Gentlemen's Club, 999 Aero Drive, Cheektowaga. $20 presale tickets available, $25 the night of the fight. Rusty Buffalo Pub, 270 Center Road, West Seneca. $10 presale, $15 at the door. The Warehouse, 4360 Milestrip Road, Hamburg. $20 per person cover charge. Dave and Buster's, Eastern Hills Mall. Two packages available: appetizers, dessert, pop, power cards, $62.51; or include unlimited video game play and drink tickets, $84.35. (716) Food and Sport at Harborcenter also is showing the fights, but it is sold out, according to its website. Know other spots showing the fight? Let us know by tweeting at @buffalodotcom.